Directer Miguel Arteta and writer Mike White follow their collaboration on THE GOOD GIRL with this hamfisted painfully earnest take on the class divide in contemporary America. 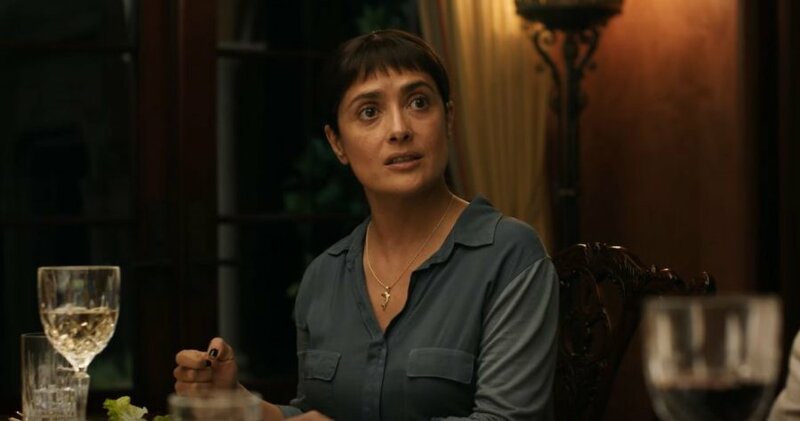 Salma Hayek plays Beatriz, a massage therapist and earnest do-gooder who treats both suffering cancer patients and rich capitalist bastards. As the film opens, there's a chance it might be a comedy. Beatriz is quirky! She keeps goats in her house and has a habit of saying socially inappropriate things and invading people's space. But that isn't what this film is. When Beatriz' car breaks down at a client's (Connie Britton - NASHVILLE) house in Newport Beach, that client invites her to stay for dinner - a small celebration of future profits on a real estate development. The rich guests (Chloe Sevigny, Jay Duplass) proceed to ignore Beatriz, then assume she's the help, then ignore her disquiet at their development. But when the richest and most evil of the men (John Lithgow) reveals he also hunts rhinos, Beatriz really loses it. The problem I have with this film is that it isn't a biting political satire or a nuanced portrait of class or race relations. Rather it's a pantomime filled with caricatures. The bad guys here are truly bad. The airhead dippy wives are just that. And Beatriz is ultimately a Christlike martyr of zero flaws and faults. This makes for dull, dumb, simplistic storytelling. The audience deserves far more. AT DINNER has a running time of 83 minutes and is rated R. The movie played Sundance 2017 and opens in the USA on June 9th.